Has Alex Schuman found success in his new vocation? Is the Alex, Inc. TV show cancelled or renewed for a second season on ABC? The television vulture is watching all the latest cancellation and renewal news, so this page is the place to track the status of Alex, Inc., season two. Bookmark it, or subscribe for the latest updates. Remember, the television vulture is watching your shows. Are you? An ABC comedy, Alex, Inc. stars Zach Braff, Tiya Sircar, Hillary Anne Matthews, Michael Imperioli, Audyssie James, and Elisha Henig. 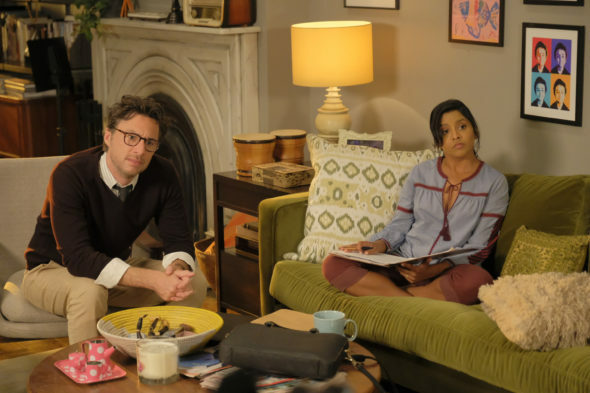 The family sitcom centers on successful radio journalist Alex Schuman (Braff). One day this husband and father quits his job in order to found his own podcast company. His wife, Rooni (Sircar) — a lawyer — is skeptical, initially. Still she, their kids, Ben (Henig) and Soraya (James), Alex’s cousin Eddie (Imperioli), and former producer Deirdre (Matthews), rally around him and put their everything into his launch. The first season of Alex, Inc. averaged a 0.84 rating in the 18-49 demographic and 3.42 million viewers. Find out how Alex, Inc. stacks up against other ABC TV shows. Alex, Inc. has been cancelled so there won’t be a second season. Could it be revived somehow? Stay tuned for further updates. Will ABC cancel or renew Alex, Inc. for season two? The ratings haven’t been very impressive. The network may renew this sitcom to give it some more time but I suspect they will cancel it instead. I’ll keep an eye on the ratings and update this page with breaking developments. Subscribe for free alerts on Alex, Inc. cancellation or renewal news. 5/11/18 update: ABC has cancelled Alex, Inc. so there won’t be a second season. Details here. Find more Alex, Inc. TV series news or other ABC TV show news. What do you think? Were you hoping that the Alex, Inc. TV show would be renewed for season two? Are you sorry that ABC cancelled this TV series, instead? Designated Survivor: Is the ABC TV Show Cancelled or Renewed for Season Three on ABC? I really like this show I miss Zach was hoping he did another sitcom and now that I get what I want and ABC cancels his show it’s stupid that all the good shows get axed! I really looked forward to this show in a big way, but so far it has yet to really grab me. Yeah, I know shows like scrubs are far and few between but this one just doesnt have any spark to it. Maybe Zach needs to call his real life best friend Donald Faison and offer him a part!